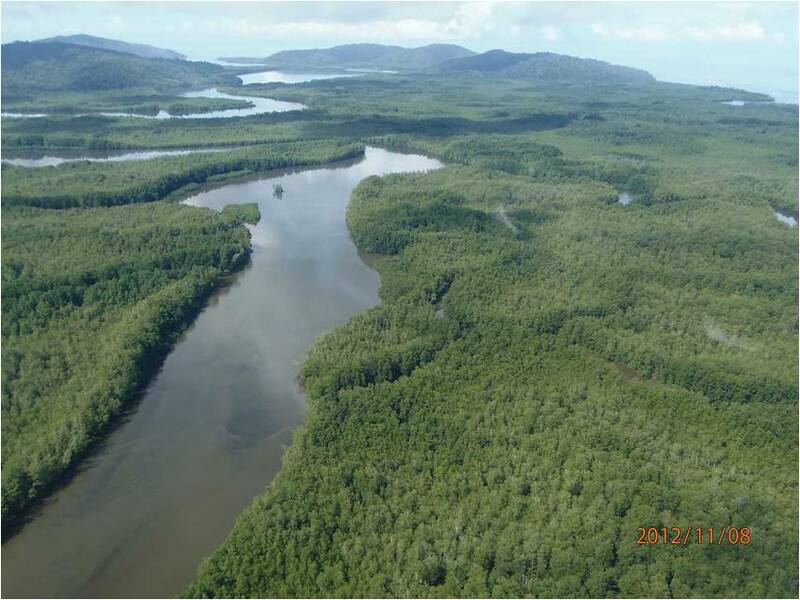 An exchange of knowledge for conservation, part 1: Wilmar travels to the Osa! This two-part series chronicles the efforts of Osa Conservation and Amazon Conservation Team to learn from one another’s conservation strategies through staff visits to each other’s field sites and the ensuing exchange of knowledge and experience. Agustin shows Wilmar and ACT how to climb trees to collect native seeds in the forest. I was born in the countryside. As a child I explored my small town walking for hours in the bush following ant trails, playing in fish streams and climbing trees to pick wild fruit like guavas, uvillas, guamas and sapodilla. When I was 10 years old, my parents decided to move to the city — I was in shock — I missed my time as an explorer looking for animal and plant species. Upon completing high school, I enrolled at the University of the Amazon and majored in Agro-ecological Engineering. While in college, I reconnected with my childhood and I wanted to learn as much as possible about the wild, be it through research, seminars, workshops or through exchanges with others (which , in my opinion, is the best way to grow and learn). When I finished my studies in 2006, I started working with communities; but whenever there was a call for proposals, scholarships, or an opportunity to participate in national and international level workshops, I applied. I deepened my knowledge and started doing coursework for my Master’s in Agroforestry. In May 2010, I was hired by ACT-Colombia. 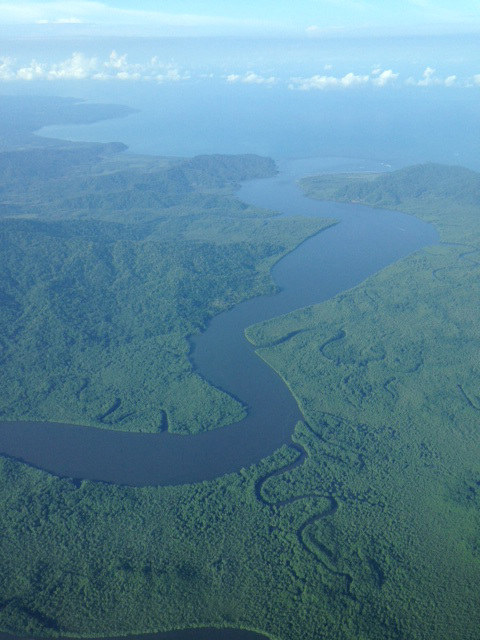 ACT was implementing the Landscape Conservation Project with indigenous and rural communities in the buffer zone of Alto Fragua Indi Wasi National Park in the Belen de los Andaquíes and San José del Fragua communities in Caquetá. Day after day I learned from the local people and began to really understand the land where I grew up. ACT gave me the opportunity to grow as a professional and as a person. In June 2013 I was invited to go to Costa Rica to give a presentation at a conference organized by the Tropical Agricultural Research and Higher Education Center (CATIE) in San José. There, Liliana Madrigal, Co-founder of Amazon Conservation Team, suggested that I travel to Puerto Jimenez to learn from the experience of Osa Conservation and exchange knowledge that I could apply upon my return to Caquetá. I did not hesitate, and readily agreed. I traveled from San Jose to Puerto Jimenez on a small plane. I did not take my eyes off the window admiring the majestic forests that were connected from the sea to the mountains. When we landed in Puerto Jiménez, Dennis Vasquez of Osa Conservation was waiting for me. Dennis drove us for 40 minutes to Cerro Osa where I met Agustin. Agustin is a local expert who was to share his knowledge about seed collection techniques and show me the OC grounds. I was reminded of my childhood days when I climbed trees to pick fruit, but this time I was going to do it using another technique. Agustin was my guide for a week walking in the forest for hours. I was amazed to see how many young people voluntarily contributed to protecting turtles, planting trees, and doing research in the area; I was impressed to see foreigners visiting Cerro Osa for the purpose of planting trees and enjoying the beauty of the forest. Time went by very fast but we took advantage of the night hours to share stories with Agustin, and in return to answer his questions and concerns. He was curious to know about the Colombian Amazon, it’s people, their culture, their ways of life — I wanted Agustin to come with me so I could reciprocate the experience and show him my territory and to have him live the same experience I was having in Osa, but I felt helpless because it was not up to me to make that happen. Upon my return to Colombia, I talked to Carolina Gil, Director of ACT- Colombia about the experience, and I proposed we invite Agustin so he could visit the indigenous communities, to exchange knowledge and share his expertise in the techniques used to collect seeds. The proposal was approved and Agustin packed his bags, overcame the fear of traveling and in October 2013 he came to Colombia, where he stayed for 10 days. During his trip he toured Bogota and Florencia, Caquetá and rode on a high speed Amazonian boat in order to get to the remote villages of the Huitotos and Coreguajes Indians. There he would share his knowledge with the communities and ACT’s technical staff. Agustin was the center of attention for his abilities, and for being from “another country.” Agustin was intrigued at the ways communities lived, for example, he did not understand why before climbing a tree, the Indians put a handful of green powder in their mouth; we explained that it was pulverized coca leaf — an ancient indigenous practice. Soon, it was time for Agustin to return to Costa Rica, but before leaving, he was showered with gifts – baskets, necklaces and everyone wanted a photo with him. 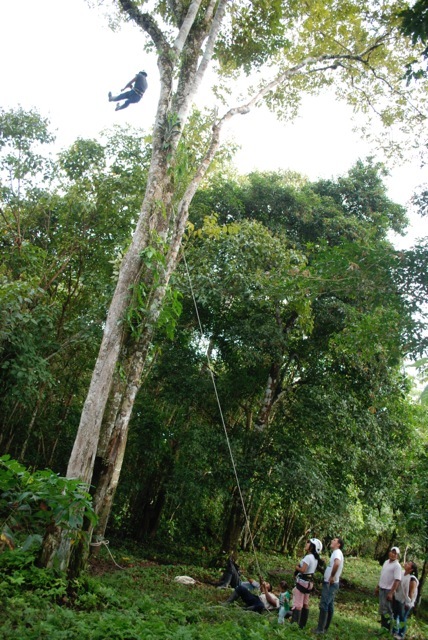 “Agustin, the man who shared with us another way to climb trees — we used to scratch our chest and belly when we climbed like monkeys; Agustin, with his ropes and other equipment showed us a more practical, simple and comfortable way to climb much higher without the risk of skinning ourselves so much” said Elias in his “maloka” or sacred meeting place for indigenous people while they were conducting the evaluation of the workshop. I believe that these exchanges are invaluable, the travel to other countries, experiencing different cultures, meeting people, seeing the way communities live, opens our minds, makes us grow as people and as professionals. The exchanges allow us to share knowledge and continue contributing to the conservation and development of our countries. Thanks to all who made ​​this possible – these are life stories that fill us with knowledge, joy and love for what we do. 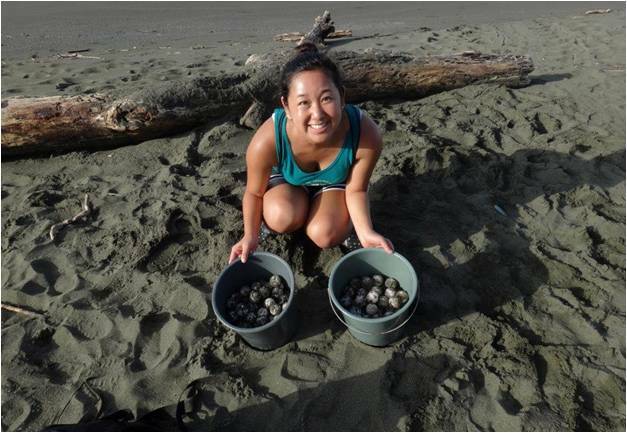 Volunteer Alisa Wang collects vulnerable turtle eggs from the beach for relocation to our hatchery. The 2013 Sea Turtle Season at Osa Conservation has ended, and what a spectacular year it was! From the opening of the new turtle hatchery to the annual festival on Carate beach, it was an exciting and successful year for OC’s sea turtle conservation program. The Osa is home to four species of sea turtles: Leatherback, Hawksbill, Olive Ridley, and Pacific Green. Our beaches mainly support populations of nesting Olive Ridley and Pacific Green sea turtles, but Leatherbacks and Hawksbills also make an occasional appearance. OC’s sea turtle season, which runs from July to December, coincides with the peak of Olive Ridley and Hawksbill nesting season. The peak of Pacific Green and Leatherback sea turtle nesting season will not begin until February and will last through March. During this low time, track sighting on our patrol beaches, Pejeperro and Piro, have been rare, and our hatchery is empty and excavated. The month of December was a time for family and friends and rounding out all the collected data. Volunteers collect hatchlings in buckets for release on Piro beach. It was quite a successful first year for our sea turtle hatchery. When nests are vulnerable, whether from predators, poachers or floodwaters from the nearby river, we move them to our hatchery. Staff and volunteers always take extra care while moving a nest, and when relocated they will simulate an environment as similar as possible to the original nest. The depth and width of the nest is measured, and sand from the original nest lines the transport bucket as well as the new nest. If the nest was laid in the shade of the vegetation or the sun, our hatchery can accommodate either. This strategy seems to have worked very well so far – 92.6% of all the nests moved this year hatched successfully! With this strategy working well, having hatched thousands of sea turtle eggs, our hopes are high for 2014. 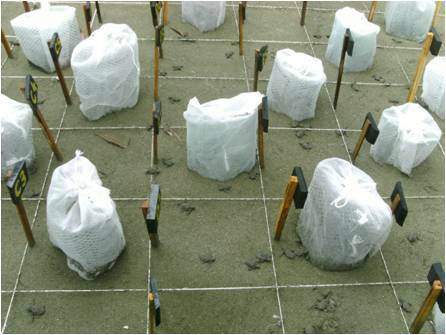 Protected nests at our sea turtle hatchery. The results are in for turtle sightings and track records on our beaches. This year we had 7 tagged turtles return to Pejeperro Beach and tagged a total of 136 new turtles between both Piro and Pejeperro beaches. Almost all of the health assessments for sighted turtles were very good – only one turtle had fibropapillomas (skin tumors caused by a virus) and two had barnacles. Even shell, flipper, and skin wounds were rarely recorded. More shell damage was seen on Piro beach, which could indicate more off-shore boat activity near that beach. As expected, the most commonly sighted turtle was the Olive Ridley (LO), but the Green (CM) takes a close second. The Hawksbills (EI) are a new addition to our sightings recorded this year, but no Leatherback (DC) tracks or turtles were recorded. 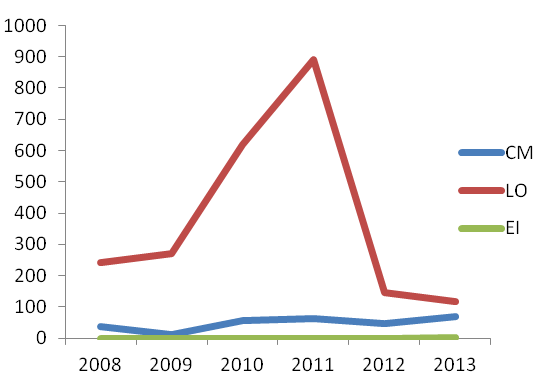 As the graph shows, this was not the best year for our turtles and our sightings records have been slowly decreasing. The reason for this is unknown, but we hope with more data collection in 2014 we can start to solve the problems and the turtle population can rebound.